One of the most frustrating things I’m seeing is new (and unfortunately experienced) bloggers deluding their brand name by over promoting their own content. This has been an issue for a while. Starting with blog comments, and now made even worse through use of social media. I published an article recently pleading for moderators of Google+ Communities to crack down on bloggers self promoting by pasting links to their latest articles and blogs within the communities. Due to that article and also due to some conversations/rants on Google+ on this topic, I realized that many other community members feel the same way. I also learned that the link spamming (aka self promotion) occurs predominantly in the SEO, social media and blogging communities. Sad, and paints a bad picture for us bloggers. I haven’t talked about brand here on Side Income Blogging much, but frankly I need to. 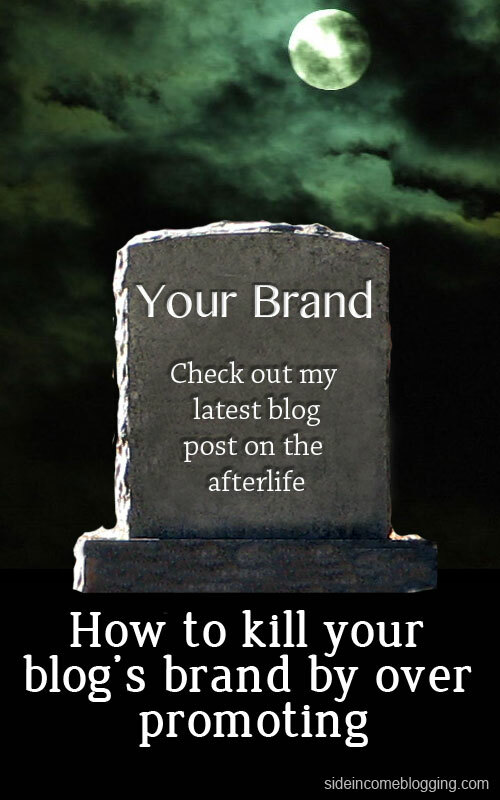 Branding is unfortunately a much over-used and misunderstood blogging topic. Simply defined though, branding is how people perceive your blog. Nothing more, nothing less. Another way to think about it is to ask yourself: When people hear my blog’s name or talk about my blog, what kinds of things do they say? Hmmm, social media and blogging community. Let’s focus on those a bit for now, I’ll jump into the other one’s in some future articles on branding. One easy and very effective way to kill your brand is by hurting your perception in social media and in your blogging community. What I mean by “your blogging community” is the set of blogs and bloggers that are in a niche similar to yours, your peers per say. For example, I blog about blogging. This community features a large number of blogs, with the most famous being ProBlogger.net. “Blogging” blogs (or meta blogs) are my community. My readers hang out in this community as do I. Understanding what community, your blog fits into is critical in understanding your social media strategy….but I digress, and I’ll save that topic also for another day. One of the quickest ways to kill your brand and put a bad taste in the mouth of your followers about your brand is to over self promote. The key word there being: over. Self promotion is good and necessary, especially when you’re new. When you first start a blog and nobody is really reading it, who else is going to promote it but you? Leaving comments on blogs just to get a link out there. Ever visit a high traffic blog and leave a comment just so you can get your blog’s link out there? Maybe the comment said something like “Great Post!” or “Thanks!” or probably the lowest of lows, “Check out my blog!”. When I first started out blogging, I was guilty of the first two. Shame on me. Liking and +1ing your own shares. While this one is a bit controversial, I’m not a fan. You created the share, let someone else like it. I mean, if you didn’t like it, why would you have posted it to begin with? Emailing other bloggers for the sake of having them promote or check out your blog. Ever send an email to a high traffic blogger saying “Love your blog, please check mine out…” or maybe even “Hi, can you link out to me? Here’s my new blog…” I know I get these types of emails at least once a week, and they go straight into the trash folder. Only sharing your latest posts on your social media account. I’ve seen this one far too much lately, especially on more interactive social media networks like Google+ and Twitter. The only thing you ever see from people on their feeds are links back to article’s on their blog. Social media is about interaction and participation. Only linking out to your blog posts will quickly get you labeled as a spammer and I can guarantee you that you won’t develop much of a following. Joining communities and only sharing your own content. This one is fresh in my mind as Google communities are new and the majority of them have already become what +Rand Wilson tagged as #linktoilet s. Tons of bloggers, especially new and inexperienced ones are filling the communities with links to their blog’s and latest posts. And speaking of self promotion. If you’re on Google+ and are interested in participating in a blogging community with ZERO link spam, join myself, +Rand Wilson and more than 80 other bloggers in the Zero Links Blogging Discussion community. Consider this a personal invite. Remember, brand is about how others perceive you. If you want the perception of your brand to be: spammer, than by all means continue the practices above. I’m quit positive though most of you would rather have a brand associated with: trust, respect and integrity – I know I do. If so, read on. Comment on blogs, BUT leave a value add comments. When you leave comments on other blogs, ALWAYS add value – either by asking a question if you legitimatly don’t know something or by sharing your own personal experience or expertise. If the comment you are adding doesn’t add value, don’t add it. Also, don’t over due it. I generally don’t add more than 1-2 comments on a blog per week. Adding too many comments can too quickly can look spammy. Linking/+1ing your shares – Just don’t. While it might not be a big deal, again I recommend you lean far away from being spammer. Let others like them for you – One like or +1 from you isn’t going to make a difference. Share your latest posts on social media, BUT also interact with your readers. Go beyond just sharing links to your content, and interact. Share other articles from websites and blogs you think your followers might find interesting. Ask your followers questions and respond to their questions and posts. Promote their content when you like it. Find a balance between self promotion and interaction, and you’re following will grow. Emailing other bloggers – Great thing to do, but don’t just email them in order to get them to link to your blog. Email them to introduce yourself, ask them questions, interact with them. Maybe later down the road, once you’ve established a good relationship with them, you can then ask for links or ask to guest post for them. But make building a genuine positive relationship your number one priority. I focus on being genuine too, because we bloggers can tell pretty quick when it’s not. Join communities, BUT don’t share your content. Communities are all about discussion and interaction. Your blog and RSS feed are for sharing your content. If people want to see your latest content, they’ll visit your profile and visit your blog, which you should have linked. When in communities, don’t link spam and contribute to making communities nothing more than #linktoilets. Answer questions, ask questions… interact! Interaction is the reason they were created! If you have a blog post that is relevant, mention that you have a blog post, but don’t link to it. If people want to read it, they’ll find it or ask you directly for it. Again, your blog’s brand is how people perceive your blog. Your blog’s brand is the first thing that comes to mind when people think of you. Manage it, keep it positive, protect it, and make it grow in a positive direction. Don’t kill it by making the above oh so common self promotion mistakes. Building a strong brand takes a significant time and effort, however killing it can occur in a matter our hours. What other ways can you hurt your brand? How can you help your brand? Disagree with something I’ve said above? Add a comment and let me know your thoughts. Some food for thought thank you. I am a new blogger and this is the sort of guidance that needs to be out there. I promise to try my best not to ruin my blog and website. Awesome post! I was thinking about writing a similar post ever since G+ started with communities. And I know we already talked about this on G+, but thanks to these awful #linktoilets (what a great word!) for me the introduction of G+ communities was both a gift and a curse. I think there are actually a lot of people like us who would rather join discussions, but overshare because everyone else is doing it too. I agree with most points that you’ve made in this post, but there is probably needed to be made a distinction when it comes to brands and branding. While a brand identity is how you want people to perceive you or your business, an brand image is how they actually perceive you (both are part of your brand). Your job is to close the gap between the two (a.k.a. branding). And you gave some great examples of how to actually do that. Hey Katy, thanks for your comment and glad you found it helpful. Hey Julian, thanks for commenting and for the additional information on branding. I agree on the distinction you pointed out and appreciate you clarifying the two. I’ve actually been wanting to write on Branding for a while, and this was the first teaser article. The new Community is actual working our really well and we have some great discussion going on…and no links! Great writing. Good to see you here. I really enjoy the zero link blog community. Thanks for the invite. Now the community grew more than 130 members. That’s awesome! I haven’t really had time t promote my own blog, since I spent more time on build other people’s blog. Thank you Terence and appreciate you stopping by and leaving a comment. I’m enjoying the community greatly too, and nice to meet and interact with so many knowledgeable people, like yourself. I’m glad I’m reading you. I see some stuff I’m guilty of, other stuff I was smart enough to avoid. It sure helps that you explain the why’s behind these do’s and don’ts. Hey Shawn, stuff we’re all guilty of a one point on another. Glad you found it helpful and thanks for taking the time to leave a comment.